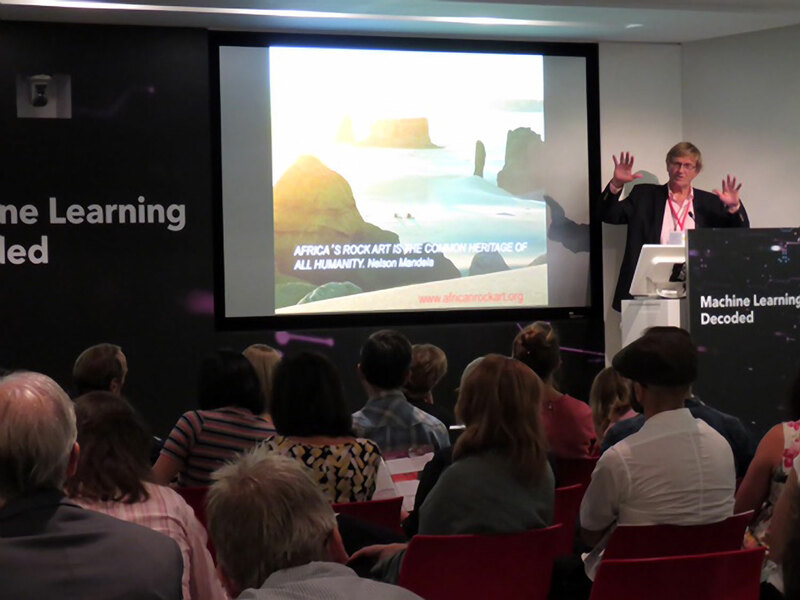 The Royal Geographical Society – Hong Kong invited David Coulson to speak on “The Rock Art of Africa: 25,000 Years of World History and Climate Change on the World’s Biggest Canvas”. “Residing in Africa for more than 40 years, British adventurer and photographer David Coulson has discovered and documented more rock art sites across the continent than anyone else. On the way, he has accumulated many amusing stories, including being charged by elephants and frequently lost in desert sandstorms. In the Kalahari, Mr Coulson spent long periods with the Bushmen when he photographed some of their ancestral art. In Egypt’s Western Desert, he used modern photographic techniques to map the trove of faint images in a huge underground cavern known as the Cave of Swimmers, because of the front-crawl-like depiction of the figures. Other African rock art discussed in the talk includes a collection of 8,000-year-old anatomically accurate carvings of nine running giraffes on an ancient riverbed in Algeria, the largest measuring 27 ft from muzzle to hind hoof. In addition, he talks of a series of white circles the size of dinner plates that migrating Stone Age hunter-gatherers painted on a granite hillside in eastern Uganda, roughly 1,500 years ago. David Coulson is a photographer, writer and African explorer as well as being a specialist in African rock art. In the 1980s and 1990s, he worked out of Kenya as a professional photographer and writer, and his books and articles were published across the world. It was during his many travels for these projects that he became aware of the richness and diversity of Africa’s rock art. Location: The Bloomberg Theatre, Hong Kong. Date: Tuesday, 26 September 2017.